I just called my husband at work to ask if he can take Saturday off so we can put Chloe to sleep. The vet gave me a few times she is available to come to our apartment and do it. I chose Saturday at 12:30. And Friday is Friday. And Saturday is Saturday. Which day is the right one? Which day is the right day to lay her body on my lap and kiss her goodbye and try to be calm for her as they give her one last sleep and then stop her heart? Which day will be best to hand her limp body to a stranger, follow her psychically to the crematorium, and try not to imagine her carcass—of which I know the weight on my chest, how the heart murmur flutters under my hand, in which places it is damp and cold and where it is dry and warm, where it has crusted with the bumps and ulcers of old age, where the fur has worn away and where it is still soft and lush, exactly like it was when she was 6 months old and we rode home together from the shelter in my boyfriend’s van, me an impulsive and stoned 19-year-old giddy with conviction that this was the perfect gift for you, my newly single mother, all alone in that house in south L.A., in chat rooms, spilling wine on yourself and on the verge of once again loving and nurturing another loser, and who would wind up giving this dog magical abilities and who would take her to work and on road trips and to the beach and let her run free without a leash, which drove me nuts but you both were free creatures and I couldn’t control anything until you were suddenly gone and the dog was missing and I prayed to Whatever was listening that if Chloe showed up I would forgive Whatever, and then the call came from the police and she and I threw our bodies against the cage bars until they were opened and we kissed each other and cried and I swore to never let anything happen to her and to love her with all my heart until the world spun in reverse and I could make everything that ever went wrong for you right—try not to imagine that body burning to ash? On what day do you end a ten-year blood oath? After you had Chloe for a few months, you called me in a panic. Chloe was missing, had jumped from the open window of your car while you were in the bank. In spite of my rage and worry, I drove you around town for two days until we found the dog in a Taoist church parking lot, unharmed and happy as you please. When I was 20, another phone call: Chloe is listing and stumbling. And an immediate call back: it’s okay, don’t come down. We think she ate a pot brownie. I’m 21: Chloe stepped on broken glass and I can’t afford a vet. Can I bum $100 for stitches? I’m 23: Chloe was bitten by a rattlesnake, but she’s fine. They gave her anti-venom and we’re picking her up tomorrow. To the untrained ear this might sounds like bad parenting. No offense. But listen to me, I’m another creature raised by you: it was one animal respecting another animal’s joie de vivre. Emotional license, you used to say to me, when we fought. “I gave you emotional license! 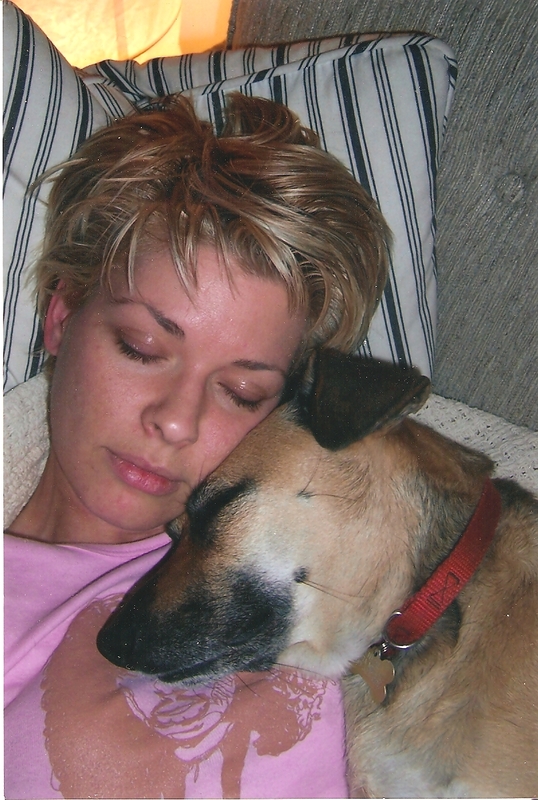 I never told you what you could and couldn’t think or feel.” Chloe traveled, met children and jazz musicians, played in the surf, rolled in mud, got taken to bars (and thrown out of them, with you), slept on a human bed, ate boiled chicken and rice. Mom, the measure of your love wasn’t worry and restriction. It was pleasure. You’d hate the way she looks now, this long, thin caramel-colored body with its jutting shoulders and spine—but she looks peaceful swallowed up by the down comforter we’ve indulged her in. Every now and then she shudders, as she has for about a year, at first seldomly and now frequently. She flinches, too, violent facial seizures that chatter her teeth. She paces at night, gives this heartbreaking whinny. She groans, reluctant to lie down, stiff and stumbling with the pain of arthritis, confusion. We tried anti-senility drugs, but she still docks herself into tight corners and can’t back out of them. She is mostly blind and deaf. Pain meds? Valium? And what then? This isn’t the dog you knew. She’s 100. It just occurred to me that you left her when she was around 50, your age. A couple of wild, middle-aged ladies. Thelma and Louise. Can you imagine being 100? Do you blame me for making this choice? There are four Greenie bones left. She loves her Greenies. On Saturday I’ll give her two. What about this case of dog food—it’s good stuff, expensive. Grain-free, hand-cooked by virgins in a cathedral in Paris, I don’t know. I just can’t cook chicken and rice each week, like you did. I’m selfish and I’m lazy and I never had children and I don’t have your hands. There are six cans left, and Saturday is two dinners away. Should I instead give her a hot dog? A warm one, bun and all? Or I’ll make her a meatloaf. I’ll give her a can of tuna—the kind with sodium. Anything you want, my love. She flinches so hard her teeth chatter, then she whimpers. There has to be another way out of here besides loss. Loss, again. Also, it’s not my right. It’s not my call. It’s your call, and you’re gone and I have to pull the trigger on my own. And suddenly I look over this long expanse of time and I’m embarrassed. Did I really think I could make this dog live forever? Did I really think that I could reverse the turning of the Earth? Did I think that by loving Chloe enough I could undo all of your tragedies, one by one, until you were undead and we had all the time in the world again? How long after she started feeling pain and misery did I keep this dog alive, waiting for the miracle to come? After you died, almost ten years ago (really? ), I held Chloe and thought about the eventual end of her life. We were fresh from scattering your ashes in the Pacific. In those days I was finding meaning all over the place, tying up cosmic loose ends—making oaths. I’ll write a book was one promise. Another was this: when it was time for Chloe to pass, whenever that would be, I would whisper in her ear, Go find Mom. I would bring her ashes to you, off the coast of Dana Point, and make right what once went wrong. Put back together what violence had torn apart. But that was when we were young and glorious and nothing could touch us—when there were no Saturdays at 12:30, only tomorrows stretched out as far as you could see. Mom, if you’re anywhere you can feel this, go to the Eastern Gate on Saturday and meet your dog. Oh my dear sweet friend. Now I understand. I’m so sad for you. Wishing you peace and comfort in the knowledge that you’re doing the compassionate and loving thing. Hugs. I think you should most definitely reconsider that book you promised to write 10 years ago. Love to your Chloe from a stranger and thanks for sharing such a beautiful story. Oh, Poppy – now it’s you who makes me cry. Love this. I’m proud of you.